Among the most common types of motor vehicle accidents, rear-end collisions can cause serious injuries or fatalities. Drivers have to be aware of the risks of rear-end crashes and of the top ways to prevent these accidents from occurring. When motorists make safer choices, crashes can be avoided. In a typical rear-end crash, the driver in the rear vehicle is presumed to be the one who is responsible for causing the accident to occur. This is because the rear driver is expected to leave enough space in order to react to what the front driver does in the car. If the rear driver hits the front car, obviously he failed to leave sufficient space, and this failure was the likely cause of the collision. Use your signals. Don’t suddenly pull into another lane as another driver could end up rear-ending you. Use the turn signals to alert motorists to your intentions. Using your signal will also help drivers behind you to anticipate when you are going to slow down in preparation for a turn. Don’t stop short if you can help it. When you slam on your brakes, you’ll be rear-ended unless the driver behind you is also able to slam on his or her brakes as well. If you can avoid stopping short, you reduce the danger. Be vigilant in paying attention to the road around you and try to look up as far ahead of you as possible so you can identify obstacles in plenty of time to avoid having to hit the brakes and stop suddenly. Try not to vary your speed too much for no reason. If you are constantly speeding up and then slowing down, other drivers behind you may have a hard time anticipating your speed and reacting accordingly. When you slow down for no reason, the driver who is directly behind you may not notice or be able to slow down his own car on time. Watch what other drivers are doing and leave yourself an escape. If you stop at an intersection, don’t pull right up behind the car in front of you as you’ll have no where to go if another car looks like it isn’t going to stop. Watch oncoming cars in your mirrors and make sure they are planning to brake when they approach your car. Even when you do everything right, you cannot control what other motorists do. You need to make sure you are doing everything you can to keep yourself safe, but must also understand your rights if another driver rear-ends you despite your best efforts. 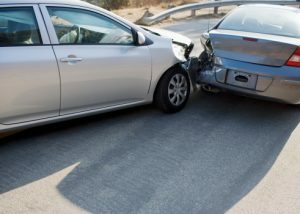 Portland accident victims should contact Zbinden & Curtis, Attorneys at Law, by calling 1-503-287-5000 or visiting http://www.zbinden-curtis.com. Serving Portland, Hillsboro, Gresham and surrounding areas.